MidCoast Maine offers incredible biking opportunities for both road and off-road biking. You can enjoy riding the roads one of our islands like Vinalhaven's 49 miles of paved roads (see video) or on the quiet roads around Lake Megunticook. On the St. George Peninsula and the Rockport Peninsula you will find scenic views and relatively little traffic. For mountain biking, the trails of Ragged Mountain and the Camden Hills State Park are fantastic. The League of American Bicyclists ranked Maine as the 2nd most bike friendly state in the country in 2011. Bicycling Magazine also named Rockland's Lobster Ride n’ Roll as one of the Top Ten Century Rides in the country. In 2019, Bike Maine will be riding in MidCoast Maine. Though it is completely sold out, you can still join the waiting list, volunteer, or follow the curated route before or after the event. Starting and ending in Brunswick, Trek Accoss Maine is also coming to our region in 2019. 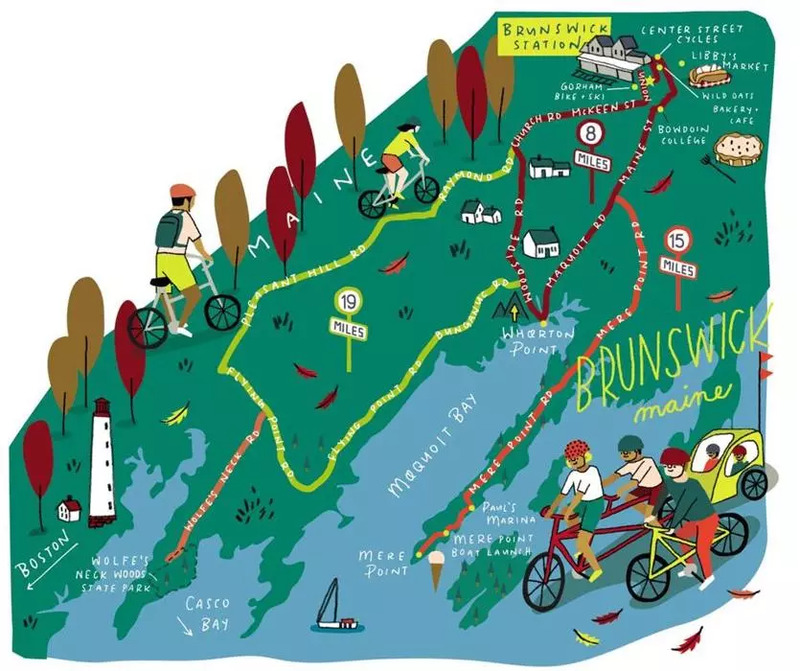 For road biking, The Boston Globe Magazine recommends these three road biking loops around Brunswick Maine (with direct train connection from Boston and Portland) for a perfect fall ride.